PM Modi will declare the launch of projects worth 5,000 crores including a bridge across the Ganga that will cost about 1,200 crores. 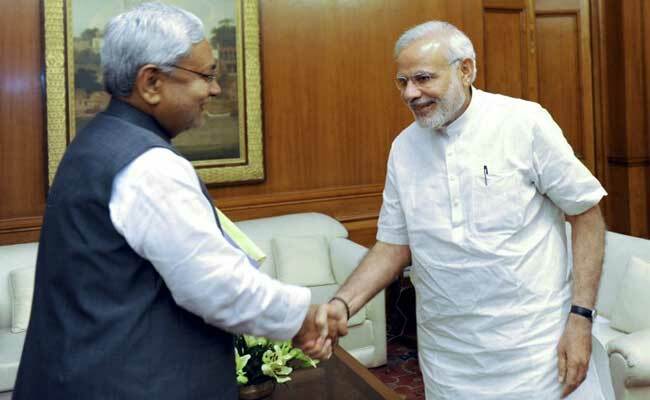 For the first time since recharging his relationship with the BJP, Nitish Kumar, the Chief Minister of Bihar, will appear in public in his home state with Prime Minister Narendra Modi. On Saturday, the two power brands will first attend centenary celebrations for the Patna University; they will then travel together in a helicopter to Mokama, about 100 kilometers away, where the Prime Minister will declare the launch of projects worth 5,000 crores including a bridge across the Ganga that will cost about 1,200 crores. Mokamah was for years part of Mr Kumar's Barh parliamentary constituency, an area he represented five times in the Lok Sabha. Ahead of the general election in 2014, he said he could not accept the decision of the BJP's national coalition, of which he was a part, to announce Mr Modi as its prime ministerial candidate. He said that the communal riots which tore through Gujarat in 2002 while Mr Modi was Chief Minister made him an unsuitable contender. The BJP did not blink and Mr Kumar ended his 17-year alliance with the party with catastrophic results - he won just two of Bihar's parliamentary seats while the BJP and it's allies, led by Mr Modi, won 31. In 2015, Mr Kumar commissioned a radical shift in politics by teaming with regional rival Lalu Yadav and the Congress to block Mr Modi's magisterial campaign. Their Maha-gathbandhan or Grand Alliance was a success story and became reference material for how the opposition could work together to combat Mr Modi's tremendous public popularity which was reinforced by the Uttar Pradesh, which gave him a record victory earlier this year. To strike off the Maha-gathbandhan, Mr Kumar cited a corruption case that named Lalu Yadav and his son and deputy Chief Minister Tejashwai Yadav. Today, when asked about corruption allegations against BJP chief Amit Shah's son, the Chief Minister said "I have not read the papers" and claimed insufficient knowledge of the accusations, which the BJP has ardently denied. That approach is likely to ensure a wrinkle-free encounter with Mr Modi. In any case, for the last few months, Mr Modi and the Chief Minister have not struggled to find common ground, exchanging enthusiastic support for each other's controversial reforms including demonetisation and a ban on alcohol in Bihar. Sources in both their parties say that ahead of Mr Kumar ending his old alliance in July for a new one with the BJP, the PM and the Chief Minister had exchanged notes on the likelihood and importance of collaborating politically.